According to Zion Chatt’s Familienbuch Caroline Hoffmann was born 16 October 1823 in Fechingen, the daughter of Jacob and Margaretha (Schmeer) Hoffmann. Caroline married Jacob Hoffmann in Germany in 1846 they had a son Ferdinand, who was born in Germany in 1847. The family came to America in 1849 and settled in Mercer County, Ohio. According to Zion Chatt’s records Caroline’s parents and her siblings also came to America in 1849. They may have all immigrated together and come directly to Mercer County. They likely knew someone that had already settled in this part of Ohio. Caroline’s mother Margaretha Hoffmann died in October 1872. Caroline’s husband Jacob Hoffmann died 24 January 1875, at the age of 52 years, 2 months, and 2 days. He is buried two tombstones away from his wife, in the same row. 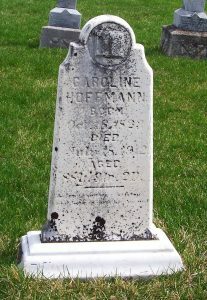 Caroline (Hoffmann) Hoffmann died 18 July 1912, at the age of 88 years, 9 months, and 2 days. She was buried on the 20th. Zion Chatt’s records and her death certificate give her cause of death as gangrene. The church record also indicates that she was survived by Mr. & Mrs. Ferdinand Hoffmann, their descendants, as well as Mrs. Deitsch and August Hoffmann. Interesting that Caroline was a Hoffmann who married a Hoffmann. Caroline’s father was Jacob Hoffmann and she married a Jacob Hoffmann. In some records the name is spelled Hoffman and even Huffman, as it is engraved on their son Ferdinand’s tombstone. 1850 U.S. Census, Liberty, Mercer, Ohio, p.286B, dwelling 11, family 12, Jacob Hoffman; Ancestry.com (accessed 19 Feb 2017); NARA microfilm M432, roll 710. 1860 U.S. Census, Liberty, Mercer, Ohio, p.358, dwelling 997, family 1002, Jacob Hoofman; Ancestry.com (accessed 20 Feb 2017); FHL microfilm 805009, NARA microfilm M653, roll 10098. 1870 U.S. Census, Liberty, Mercer, Ohio, p.149A, dwelling 111, family 102, Jacob Hoffman; Ancestry.com (accessed 19 Feb 2017); FHL microfilm 552742, NARA microfilm M593, roll 1243. 1900 U.S. Census, Liberty, Mercer, Ohio, ED 85, p.9A, dwelling 164, family 169, John Hoffman; Ancestry.com (accessed 19 Feb 2017); FHL microfilm 1241304, NARA microfilm T623, roll 1304. Hi. I enjoyed your information about the Rev. J.D. Gackenheimer. My 2nd great grandparents were married by him in Harrison Township on Nov. 25, 1856. 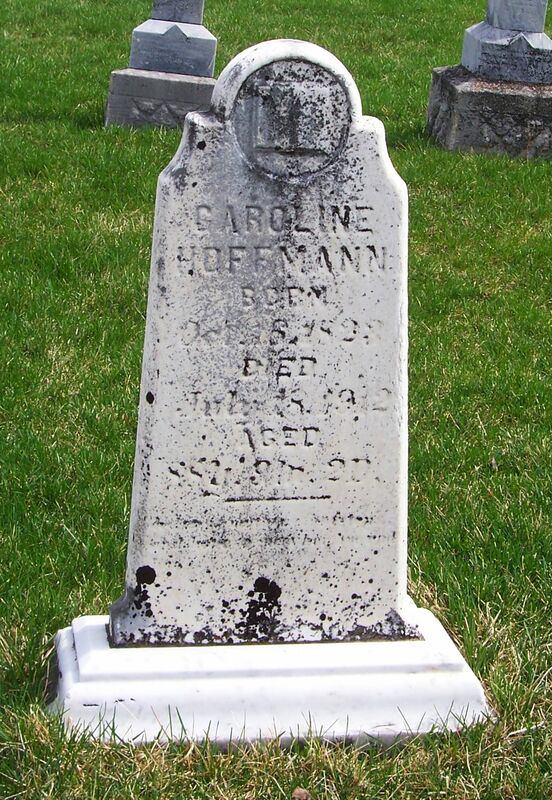 In a Tombstone Tuesday you wrote about a Caroline Hoffmann who also married one of that surname, and that was also the case with my gg grandparents with Christopher Hoffman marrying Margaret Hofman. In Christopher’s bio in Gilliland’s 1908 history of Van Wert County, Margaret’s parents were mentioned briefly as “Philip and Mary (Wendle) Hofman,” and Philip’s description in it as “a leading farmer of Harrison Twp.” leaves a misleading impression that they were still alive when it was published. Thanks to DNA results from a descendant of their younger daughter Katharine (1844-1935), I have finally identified Margaret’s parents as Philip Peter Hofman (1803-1888) and Marie Elizabeth Wendel (1803-1872). The Rev. Gackenheimer also married Katherine in 1864 to Ludwig Oechsle, and that was the reason I was looking for more info about him. Although my Hoffmans spent much of their lives in America in Van Wert’s Liberty Township which is somewhat off your beat, there are some similarities to Caroline’s family. Both families were “Forty-Eighters” who left Germany during the supercharged period of European revolution & reaction. Born in Thungen, Main-Spessart, Bavaria in 1831, Christopher found himself attracted to the popular “Frankfurt Legislature” which hoped to broker a united, republican Germany. Gilliland introduces some euphemistic phrases to explain why a 17-year-old young man was in Frankfurt-am-Main, but I have assembled a time line which shows Gilliland’s stilted language still corresponds with historical events. The Kingdom of Prussia approved of the Legislature only as far as its willingness to offer the crown of a united Germany to the Prussian royal house otherwise uninterested in democratic ideals. Prussia increasingly played a reactionary role as summer dreams turned to fall despair. The crisis came when a mob of supporters of the Legislature surrounded two particularly unpleasant reactionary legislators and beat one to death. What Christopher’s role in this is uncertain, but Gilliland (or one of his writers) says the young man took part in “two desperate battles” as a member of “the patriotic army” which no doubt were two street battles between street supporters of the Legislature’s reform wing and mercenaries in the pay of Prussia. The Prussians introduced artillery to the streets in the second “battle” on Sept. 18, and Christopher had to flee for his life. Gilliland says Christopher and his father had property “which was by no means inconsiderable” confiscated, and Gilliland says friends hid him in a dry goods crate bound for Maintz. It was handled so roughly that his shoulder was separated. After a period of convalescence, he traveled to Rotterdam where he left for America, arriving in early 1849 following a sailing voyage of 49 days. In Richland County he almost immediately returned to politics, canvassing voters for a candidate for sheriff. After his guy won, he was rewarded with an appointment as a deputy — a job he held for 18 months. He then went to work for a steamboat company in Sandusky. Sandusky had back-to-back cholera epidemics in 1849 and 1850, and you can still see the “Cholera Cemetery” opened there for the 1849 epidemic. Arriving in mid summer, he most likely assisted with the 1850 outbreak. After returning to Richland County where he was “engaged in agricultural pursuits,” he arrived in Van Wert city around 1853 where he operated a bakery (according to Gilliland) & a grocery (according to the 1860 census) until 1865. I have been unable to discover where this was located, but the old Star at the corner of Main & Market was both a bakery and a grocery. An old frame building torn down during the Thirties to build the Schines Theatre, the Star makes a good candidate. In any event, he then purchased 80 acres straddling the Rockford Rd at what would become the south edge of Enterprise/Ohio City. As president of the Ohio City school board, he planned and oversaw construction of Ohio City’s original high school and hired its superintendent — “Professor” Ellsworth Brown (no relation) — who later became his son-in-law.when he married daughter Caroline. After Christopher & Margaret’s death, my great grandparents lived there briefly, the farm having shrunk to 40 acres on the west side of the road, then my dad and his brothers lived there until 1928 when my grandfather & grandmother sold it to finance their move to Van Wert city.. Thank you for all that great information. So interesting and perhaps it will help some other family researchers. It is also interesting to hear how DNA helped your research. Thanks for writing!